Don’t Let Writers Stand Alone – All Media Workers Should Join the WGA on Strike! For Workers Strikes Against the War! This is the first time in decades that an American union has decided to undertake industrial action against a U.S. war. It is doubly important that this mobilization of labor’s power is to take place on May Day, the international workers day, which is not honored in the U.S. Moreover, the resolution voted by the ILWU delegates opposes not only the hugely unpopular war in Iraq, but also the war and occupation of Afghanistan (which Democratic candidates Hillary Clinton and Barack Obama and Republican John McCain all want to expand). The motion to shut down the ports also demands the withdrawal of U.S. troops from the entire region, including the oil sheikdoms of the strategically important Persian/Arab Gulf. 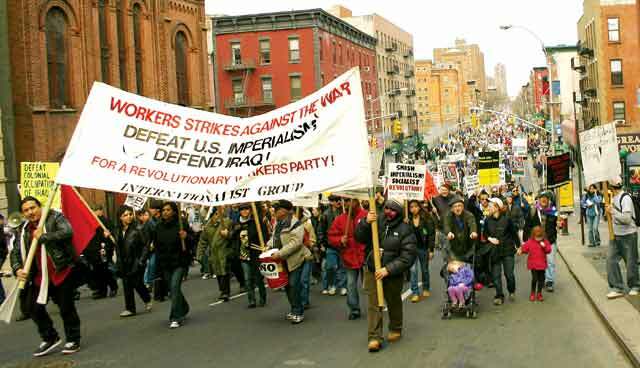 The Internationalist Group has fought from the moment U.S. troops invaded Afghanistan in September 2002 for American unions to strike against the war. 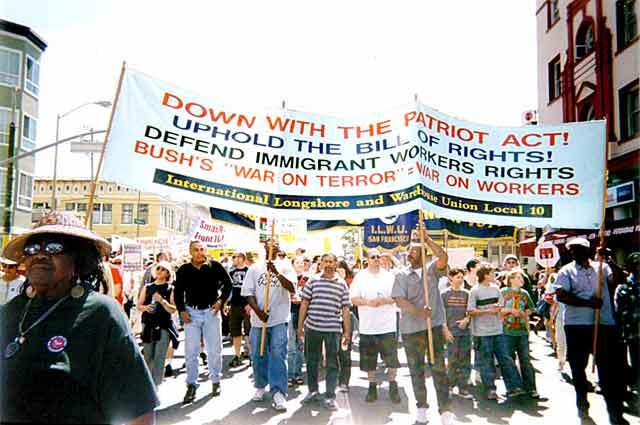 [See “Mobilize International Labor Action to Defend West Coast Dockers!” The Internationalist No. 14, September-October 2002.] Despite the fact that millions have marched in the streets of Europe and the United States against the war in Iraq, the war goes on. Neither of the twin war parties of U.S. imperialism – Democrats and Republicans – and none of the capitalist candidates will stop this horrendous slaughter that has already killed hundreds of thousands of Iraqis. The only way to stop the Pentagon killing machine is by mobilizing the power of a greater force – that of the international working class. The action announced by the powerful West Coast dock workers union, to stop work to stop the war, should be taken up by unions and labor organizations throughout the United States and internationally. The ILWU should be commended for courageously taking the first step, and it is up to working people everywhere to back them up. Wherever support is strong enough, on May 1 there should be mass walkouts, sick-outs, labor marches, plant-gate meetings, lunch-time rallies, teach-ins. And the purpose of such actions should be not to beg the bourgeois politicians whose hands are covered with blood, having voted for every war budget for six and a half years, but a show of strength of the working people who make this country run, and who can shut it down! There should be no illusions that this will be easy. No doubt the Pacific Maritime Association (PMA) bosses will try to get the courts to rule the stop-work action illegal. The ILWU leadership could get cold feet, since this motion was passed because of overwhelming support from the delegates despite attempts to stop it or, failing that, to water it down or limit the action. And the U.S. government could try to ban it on the grounds of “national security,” just as Bush & Co. slapped a Taft-Hartley injunction on the docks during contract negotiations in the fall of 2002, saying that any work stoppage was a threat to the “war effort,” and threatened to occupy the ports with troops! May 2008 Oakland picket. 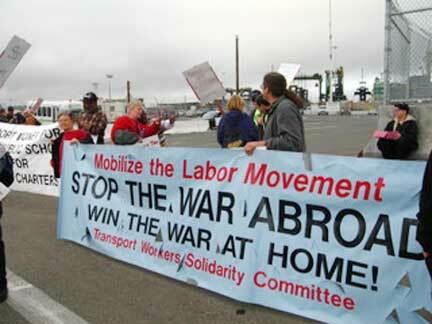 Now ILWU itself is calling to stop work against the war on May Day 2008. Workers strike action against imperialist war isn’t new – it just hasn’t happened here for a long, long time. During World War I there were huge mass strikes in Germany against the battlefield carnage, culminating in the downfall of the kaiser in November 1918. A year earlier in Russia, working-class opposition to the war led to the overthrow of the tsar and the October Revolution led by Lenin and Trotsky’s Bolsheviks. The Internationalist Group and League for the Fourth International call today for transport workers to “hot cargo” (refuse to handle) war shipments. In the early 1920s, Communist-led French dock workers did exactly that, boycotting ships carrying war materiel to suppress a colonial rebellion in the Rif region of Morocco, as they also did during France’s war in Indochina in the 1950s. In the U.S., the ILWU struck in 1948 amid Cold War hysteria and in defiance of the “slave labor” Taft-Hartley Act to defend its union hiring hall against the bosses and government screaming about “reds” in the union leadership. In 1953, at the height of McCarthyite witch-hunting, the ILWU called a four-day general strike in Hawaii of sugar, pineapple and dock workers over the jailing of seven union members for being communists. During the Vietnam War, socialist historian Isaac Deutscher said that he would trade all the peace marches for a single dock strike. 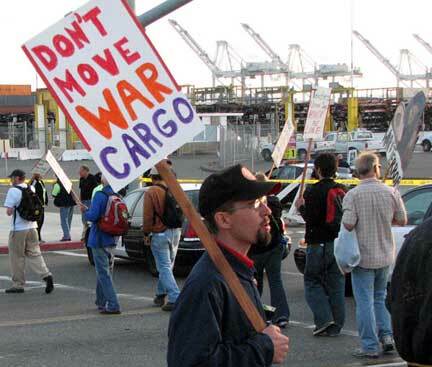 The ILWU was the first U.S. union to oppose the Vietnam war, but during war and especially during the 1971 strike union leader Harry Bridges refused to stop the movement of military cargo. (Ship owners made use of this by falsely labeling cargo as “military” to evade picket lines and undermine the strike.) This betrayal went hand in hand with a “mechanization and modernization” contract that slashed union jobs. As the U.S.-led imperialist invasion of Iraq was looming, in January 2003 train drivers in Scotland refused to move a freight train carrying munitions to a NATO military base. The next month, Italian railroad unionists and antiwar activists blocked NATO war trains by occupying the rails. In the United States, ILWU dock workers were a target of “anti-terrorist” government repression, as police fired supposedly “less than lethal” munitions point blank at an antiwar protest on the Oakland, California docks, injuring six longshore workers and arresting 25 people (who eventually won their legal case against the police). 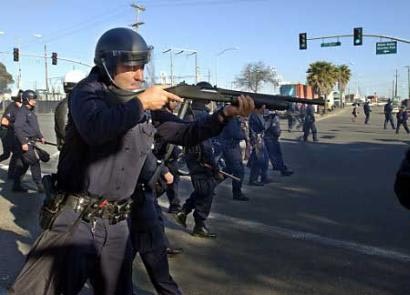 [See “Oakland Cops Shoot at Longshore Workers and Antiwar Protesters,” The Internationalist No. 16, May-June 2003.] And every year since the war started, the San Francisco/Oakland ILWU Local 10 has voted for motions for labor action against the war. Usually they were voted down at caucuses and conventions of the ILWU, but not this time. As the conference date approached, the union was the target of several police attacks, including a vicious cop assault on two black dock workers from San Francisco working in the port of Sacramento. Some 250 demonstrators from every ILWU local in Northern California rallied in their defense outside the courthouse. Their trial to be set march 18 at a hearing will encounter even larger demonstrations. The Internationalist Group and its union supporters helped build and attended the October 20 conference, along with some 150 labor and socialist activists from the Bay Area, elsewhere in California and across the country. At the meeting, a particular focus was resistance to the Transportation Workers Identification Card (TWIC), which threatens minority workers and the union hiring hall, and which the Democratic Party in particular has been pushing in order to carry out a purge of dock workers in the name of the “war on terror.” Not long after that conference, a federal judge ordered Local 10 elections canceled and replaced by a Labor Department-run vote, on the eve of 2008 contract bargaining. Federal agents even invaded the union hall to enforce their order. This action is a threat to the independence of all unions. This set the stage for the recent longshore-warehouse caucus, which voted on a motion for a 24-hour “No Peace, No Work Holiday” against the war. The resolution was introduced in Local 10 by Jack Heyman, who also presented the motion for the 24 April 1999 coast-wide port shutdown demanding freedom for Mumia Abu-Jamal, the former Black Panther and renowned radical journalist who has been on Pennsylvania’s death row for the last quarter century. Although the union tops maneuvered to prevent Heyman from being elected as a delegate to the Coast Caucus, the motion passed in Local 10. At the Caucus, the delegate from Local 34 referred to the October Labor Conference to Stop the War as the origin of the motion. At the close of the Caucus on February 8, there was a vigorous debate on the resolution. The union tops tried to stop it, to no avail. They kept asking, “are you sure you want to do this action.” The delegates overwhelmingly said “yes.” Even conservative trade unionists, including veterans of the Vietnam War, were getting up saying the government is lying to us, we’ve had it with this war, we’ve got to put a stop to it now. So instead the bureaucrats tried to gut the motion, which was cut down from 24 hours to 8, and changed into a “stop-work” meeting (covered by a contract clause) instead of a straight-out shutdown, thinking that this would lessen opposition from the employers. In the end there was a voice vote and only three delegates out of 100 voted against. The efforts to undercut the motion continue, as is to be expected from a leadership which, like the rest of the pro-capitalist labor bureaucracy, seeks “labor peace” with the bosses. In his letter to Sweeney, ILWU International president tried to present the action as an effort to “express support for the troops by bringing them home safely,” although the motion voted by the delegates says nothing of the sort. Playing the “support our troops” game is an effort to swear loyalty to the broader aims of U.S. imperialism. It aids the warmongers, when what’s needed is independent working-class action against the system that produces endless imperialist war. Yet despite the efforts to water it down and distort it, the May 1 action voted for by the ILWU delegates is a call to use labor’s muscle to put an end to the war. Mobilize Labor’s Power to Defeat the Bosses’ War! strikes against the war and hot-cargoing war materiel since outset of war on Iraq and Afghanistan. For the West Coast dock workers union to shut down the ports against the war means a big step forward in the class struggle. The Internationalist Group has uniquely fought for workers strikes against the war, when all the popular-front “peace” coalitions dismissed this and even some shamefaced ex-Trotskyists refused to call for it, saying it had “no resonance” among the workers (see our October 20007 Special Supplement to The Internationalist, “Why We Fight For Workers Strikes Against the War [and the Opportunists Don’t]”). With signs, banners and propaganda we have sought to drive home the central lesson that it is necessary to defeat the imperialist war abroad and the bosses’ war “at home” by mobilizing the power of the workers movement independent of and against the capitalist parties. That means fighting the war mobilization down the line. First and foremost, this means actively joining the struggle for immigrant rights as the government turns undocumented working people into “the enemy within.” Class-conscious workers should demand full citizenship rights for all immigrants. Last year, San Francisco Local 10 voted to stop work and join marches for immigrant rights on May 1, but this was opposed by the employers PMA and sabotaged at the last minute by the union tops. Shamefully, Local 13 in Los Angeles, a majority Mexican American port, made no protest when police attacked immigrant rights protesters that same day. Today, as the ICE immigration police stage Gestapo-style raids across the country, organized labor should take the lead in organizing rapid response networks to come into the streets to block the raids. Despite the campaign by the capitalist media and politicians to whip up anti-immigrant hysteria, there is widespread disgust among American working people toward the jackbooted storm troopers who are terrorizing immigrant communities. 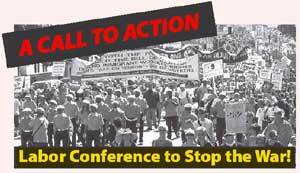 Call for October 2007 labor conference to stop the war sponsored by ILWU Local 10. Now is the time to act! At the same time, the unions should use the power to put a halt to the attacks on civil liberties which are part of the home front of the imperialist war. Driver’s licenses with biometric data, TWIC identification cards with “background checks,” warrantless spying and phone tapping, setting up special military tribunals for “trials” in which defendants are denied the right of habeas corpus, to know the “evidence” or even the charges against them – all these are part of a drive that is in high gear pushing the United States toward a full-fledged police state. There have been scores, perhaps hundreds of resolutions by unions and city, county and state labor bodies against the U.S.A. PATRIOT Act, showing that labor activists are well aware of the danger. But just as is the case with the countless union antiwar resolutions, there has been no labor action. It is commonplace in the labor movement to bemoan the lack of real action when Reagan broke the 1981 PATCO air traffic controllers’ strike, paving the way for massive union-busting, takeaways and racist attacks all down the line. Let’s not let the labor bureaucrats bury the vital struggles of today. The following resolution, originally introduced by International Longshore and Warehouse Union Local 10, San Francisco Bay Area, was amended and approved overwhelmingly after debate at the Longshore-Warehouse Coast Caucus on February 8. That a clarion call from the ILWU be sent with an urgent appeal for unity of action to the AFL-CIO, the Change to Win Coalition and all of the international labor organizations to which we are affiliated to bring an end to this bloody war once and for all.